We have now entered what is called the Upper Peninsula of Michigan, or simply "U.P." to the locals. 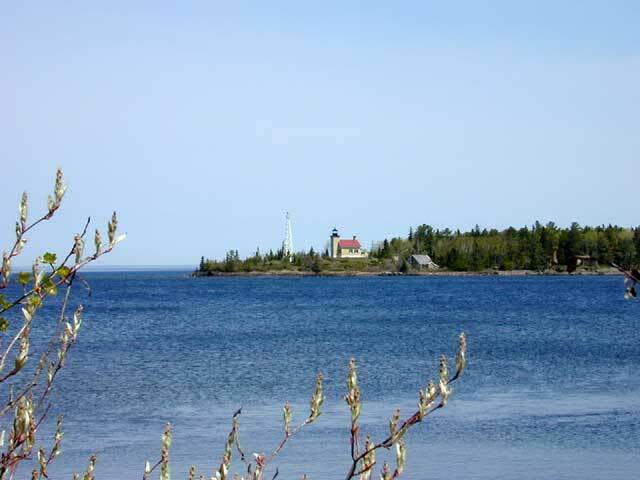 We are wandering along the southern shore of Lake Superior. Not many private campgrounds here, mostly State Park campgrounds. On the shores of Gitche Gumee (aka Lake Superior). That truly is ice in the middle of the picture. The lake was almost entirely frozen this winter and the thawing is still taking place. Spring comes late to this country - the jonquils, tulips and daffodils are in full bloom right now. It is an interesting experience for us to be sleeping under a down comforter and getting up in the morning to 38 degrees. There was a lot of copper mining in this part of the country. A lot of the supplies were brought in by boat - hence the need for the lighthouse to protect this part of the coastline.